In 10-inch skillet, cook chorizo over medium-high heat about 5 minutes, stirring frequently, until brown; drain. In medium bowl, thoroughly stir hot milk, dry potatoes, onion, melted butter, parsley, garlic and salt until consistency of stiff mashed potatoes. Stir in chorizo. Heat oil on griddle over medium-high heat. 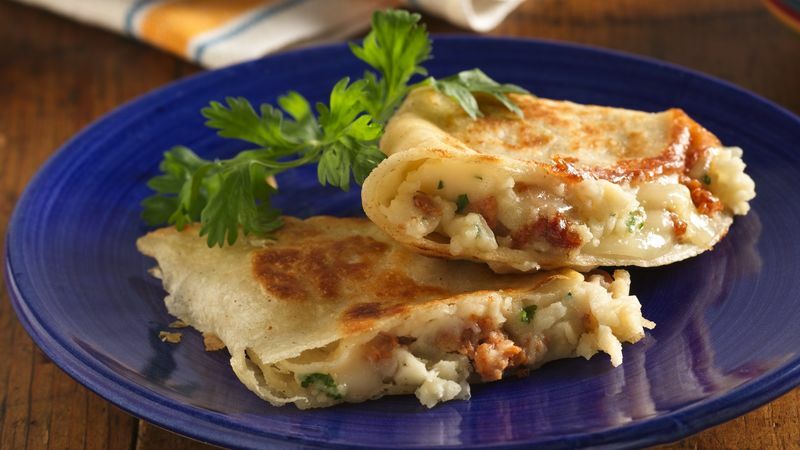 Place 2 tablespoons filling on half of each tortilla; top filling with 1 slice cheese. Fold each tortilla over onto filling. Heat on griddle, turning once, until cheese is melted. Serve with your favorite salsa, if desired.